Early photography quite frequently shows action figures with unused features or altered details. In the case of the first twelve Star Wars figures, one of the most significant differences is in the appearance of the double-extending lightsabers. 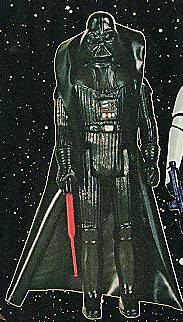 In photos of Vader in particular, the lightsaber is shown as having a small knob on its extreme end, a feature which presumably would have aided in gripping the saber and pulling it out, as well as kept its thin extension from slipping back into the larger shaft. Vader is shown in numerous photographic examples with this type of saber, including the 12 Figure and Collect All 21 store display hangers, and the 12-back long display header. 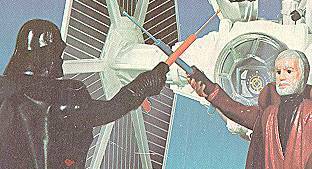 This photo, however, taken from a side panel of the TIE Fighter box, shows both Ben and Vader with tipped sabers which actually appear slightly different than the Vader saber shown on the aforementioned displays. The TIE Fighter box sabers have more of a "knob" at their ends, which is larger and more perfectly-formed than the others appear to be. The sabers on the TIE box might actually have been airbrushed and only intended to represent the saber concept as it was planned at that time. In any case, these tipped sabers represent an early form of the telescoping lightsaber design which was abondoned prior to the small production run.